Last show before the tour break! | ..:: The Razorblades ::..
Last show before the tour break! After 110 shows the SNAPSHOTS FROM THE UNDERGROUND TOUR comes to an end. 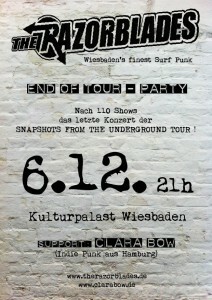 Please join us at the „end of tour party“ in our hometown Wiesbaden. After that we’ll dissapear for a few weeks and work on new songs…recording is scheduled for June!